Introduction: The available options for reconstruction of bony defects of the mandible include free graft, non-vascularized graft, pedicle flap, distraction osteogenesis, reconstruction plate, Titanium-made mesh (Ti-mesh) and allografts. Ti-mesh is a reconstruction method that has the advantage of forming the mandibular shape, which is created, based on prototype and lead to improvement in appearance, activity, swallowing, chewing, speech, mood and mental health. The feasibility of this method is remarkable. 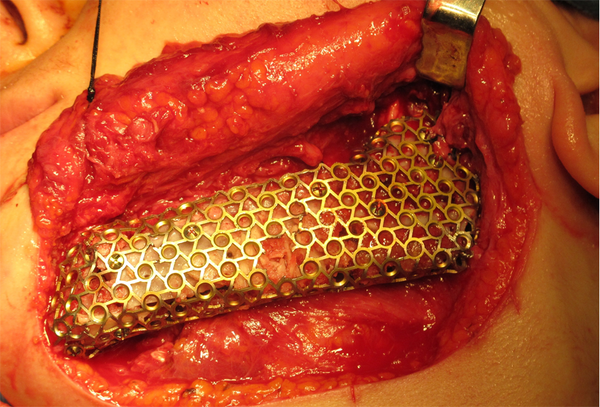 Case Presentation: A 35-year-old female whom underwent left mandibular resection due to aggressive central giant-cell granuloma and failure of reconstruction using plate and autogenous bone graft, presented as a candidate for reconstruction with a custom-made Ti-mesh tray using prototype and autologous bone from ilium with allograft, because of gradually developed limitation in the mouth opening, alteration of facial contour, asymmetry and deviation. Conclusions: Using 3D CT scan to produce a prototype and reconstruct the mandible with a custom-made Ti-mesh tray was useful. Patient was followed up for 14 months. Mandibular deviation was largely corrected. There was no complication in the donor site. No sign of extra or intra oral fistula, dehiscence or infection was detected. Ti-mesh technique has three major advantages over other methods: it can reproduce the natural configuration of the mandible, needs no special surgical experience and can be harvested from the iliac crest with no complication or failure. Numerous etiologies lie behind mandibular defects, among which, severe trauma and oncologic resection are of utmost importance (1). The challenge in reconstruction of wide defects in the mandible arises from distinctive anatomy, vascularization, types of donor sites and available treatment options (2). Some of the available options for reconstruction of bony defects of the mandible include free graft, non-vascularized graft, pedicle flap, distraction osteogenesis, reconstruction plate, Titanium-mesh and allografts (3). Appropriate selection of the reconstruction method should be based on the clinical setting with an eye on the advantages and drawbacks of each method (3). Ti-mesh is a reconstruction method that is presented in the following case. Ti-mesh reconstruction has the advantage of forming the mandibular shape, which is created by computer software based on preoperative computed tomography data or prototype. Lack of management of mandibular defects may lead to problems in appearance, activity, swallowing, chewing, speech, mood and mental health (4). Mandibular reconstruction significantly increases young patients' quality of life and mental health (5). Here, we evaluate the feasibility of mandibular reconstruction using a custom-made titanium mesh (Ti-mesh) tray and concomitant autogenous bone harvest from the ilium with allograft, due to the failure of previous reconstruction plate and bone graft. 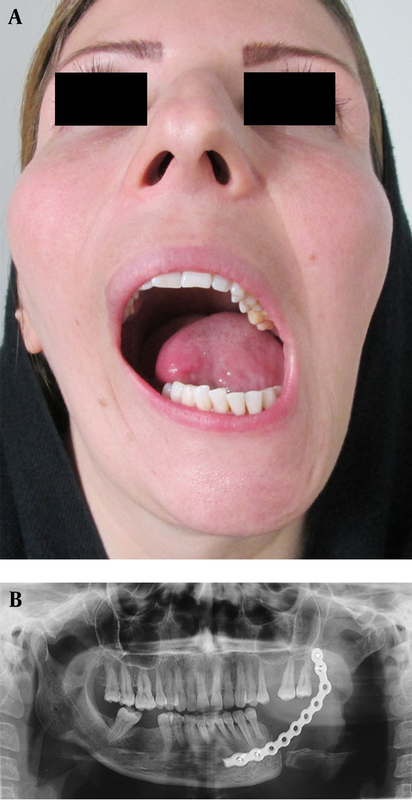 A 35-year-old female presented to the oral and maxillofacial surgery department of Buali Hospital, affiliated to Islamic Azad University, Dentistry School, Tehran, Iran, with the chief complaint of pain and swelling on the left lower jaw. Incisional biopsy studies found an aggressive central giant-cell granuloma (CGCG); therefore, the patient underwent left mandibular resection with the margin of 1 cm extending from the second premolar to the ipsilateral condyle. The inferior alveolar nerve (IAN) was not preserved. The mandible was stabilized with a reconstruction plate. Over a one-year follow-up, no radiological sign of recurrence was identified on the borders of resection; thus, autogenous iliac bone graft was used for the reconstruction of the defective part. One month later, patient developed local infection for the lack of soft tissue coverage. Antibiotic therapy was not successful; therefore, removal of the sequestered bone and curettage of the infected area was performed. 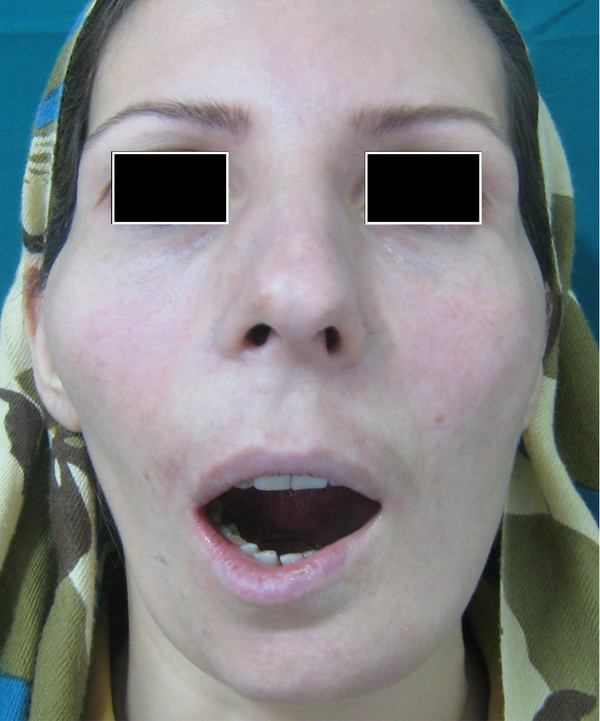 Six months later, the patient gradually developed limitation in the opening of her mouth, alteration of facial contour, asymmetry and 12 mm leftward deviation of her mandible due to mal-positioning of the reconstruction plate (Figure 1). A tense fibrous band was visible intraorally at the site of the defect. Ultimately, it was decided to have a reconstruction using a custom-made Ti-mesh tray and autologous bone with allograft. A) Facial asymmetry and mandibular deviation before Ti-Mesh reconstruction; B) Panoramic view: Mal-Positioning of the reconstruction plate. A resin prototype with the aid of a 3D CT scan was made. The site of the defect was waxed up in accordance with the contralateral side to correct the position of the condyles (Figure 2). Ti-mesh with the thickness of 0.6 mm was adapted to the waxed-up site on the prototype and was then sterilized. For the surgery, a submandibular incision with an anterior extension was made (facial vein and artery were ligated but the marginal mandibular nerve was not detected). Following the removal of the broken reconstruction plate, the titanium tray was adapted and fixed with two screws on each side. The tray was filled with harvested crushed iliac bone (about 7 × 4 cm) acquired through an anterior approach and allograft material. The closure was concluded in three layers with no intraoral exposure (Figure 3). Patient was followed up for 14 months. Mandibular deviation was largely corrected. There was no complication in the donor site. No sign of extra or intra oral fistula, dehiscence or infection was detected (Figure 4). Ti-mesh technique has major advantages over the other mandibular reconstruction methods like its reproducibility of the natural contour and no need for special surgical expertise. Mandibular resection, especially in the setting of aggressive odontogenic tumors, can lead to defects in the bone, oral lining mucosa and occlusion. It can also severely impair the quality of life (6). Many methods are described for reconstruction of mandibular defects. The treatment of choice is primarily based on the extent of the preoperative defect. The use of non-vascularized bone graft is conceptually and technically simple, which basically relies on regeneration of new bones (3). However, vascularized-free flaps regenerate both larger amount of bony tissue and soft tissue covering the reconstructed bony segment. Additionally, healing resembles a physiologic fracture healing in this method. On the other hand, non-vascularized bone grafts with osteo-inductive growth factors may decrease the risk of graft failure and prevent transfer of free tissue (3). Many donor sites are available for autologous bone graft harvest such as mandibular symphysis, rib, fibula, iliac crest, tibia and calvarias. These sites are different in terms of embryologic characteristics, type of bone and architecture. This could be the potential source of advantages and disadvantages (1). Fibular free flap is the flap-of-choice in mandibular reconstruction (4). However, in younger patient, there is a concern about leg movement after surgery and short-time morbidity. It is technically difficult to mimic the contour of the mandible with this method due to the straight configuration of the fibula, but the functional outcome looks acceptable (5). The radius tends to fracture under heavy load and is easily devascularized. Iliac crest flaps have limitations in harvesting due to the shape of the bone. Pedicle of Trapezius and Pectoralis osteomyocutaneous flaps often do not provide enough tissue (7). Metal plates and prosthetics need soft tissue coverage. Combination of these two has been associated with unacceptable rates of flap failure (8). Molding the plate after resection is time-consuming and impossible in patients with a distorted mandibular contour. Aligning the plate and stabilizing it before the resection surpasses these problems (6). Plate bending is trial-and-error intra-operatively (9). The plate must have adequate anatomic adaptability and proper contouring feature to accompany acceptable esthetic and functional outcome following the surgery (9). Ti-mesh technique has three major advantages over the other mandibular reconstruction methods. First, it can reproduce the natural configuration of the mandible, which esthetically contributes to a near-normal postoperative facial contour. Second, no special surgical experience is required in this reconstructive surgery. Third, bone can be harvested from the iliac crest with no complication and no substantial bone defect. Although this is a preliminary report, our result suggests that this method is clinically feasible. A disadvantage of this method is difficulty in adjusting the tray following intraoperative alteration in prior reconstructions. Preparing the tray is time-consuming and the expenses might currently limit its widespread use (10). There are some studies reporting potential possibility of Ti-mesh-associated infection or inflammation (10) that was not observed in our patient. Other less common complications include unpredictable resorption of bone inside the Ti-mesh and breaking of the Ti-mesh (Table 1) (10). 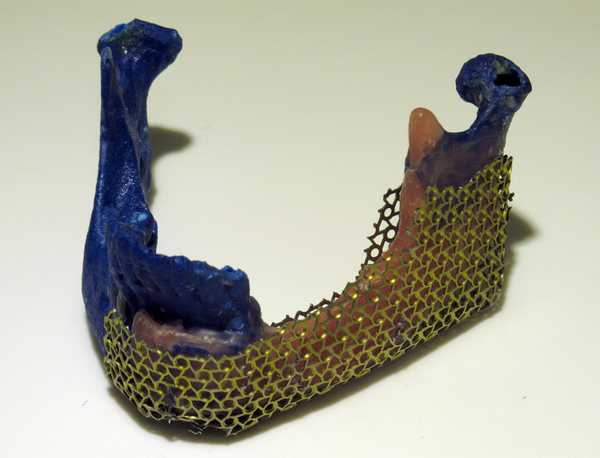 Using 3D CT scan to produce a prototype and reconstruct the mandible with a custom-made Ti-mesh tray was useful. We did not find any sign of fracture or intraoral exposure of the tray. No significant complication in the donor site, fistula, dehiscence or infection was identified. Authors would like to appreciate the Department of Oral and Maxillofacial Surgery of Buali Hospital of Islamic Azad University, Dentistry School, Tehran, Iran. Authors’ Contributions: All authors contributed in gathering data and drafting the paper. The surgical procedure were also done by Farzin Sarkarat and Zahra Malekpour.